It happens. Pots and pans get rusty. But don’t throw them out quite yet! Learn how to get your rusty cookware looking like new with just a few items you probably have on hand: a potato and baking soda or salt. MacGyver would be proud. Talk about organic cleaning – this little trick is an amazing one to have up your sleeve. With just two ingredients, a few minutes and a little elbow grease, your rusty cast iron or aluminum pans can be as good as new. This great tip isn’t just limited to cookware – try it on anything metal to get rid of pesky rust. Dip the cut part of the potato in salt so it is generously covered. Firmly rub the salted potato over the rusty areas. 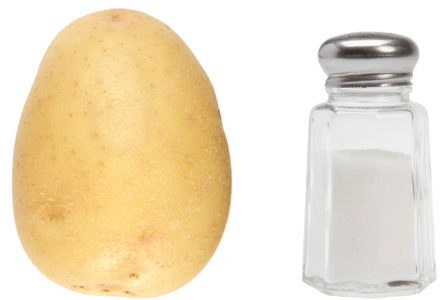 Occasionally slice the off the salted end of the potato and dip in more salt as necessary. Scrub until the rust is gone. Thoroughly rinse. That’s it! Potatoes naturally contain oxalic acid, which can also be found in many household cleaning products (don’t worry, the amount present in potatoes is not harmful to your health!). The acid helps dissolve rust, while the salt acts as a mild abrasive.